Walking through Green Dale this Saturday on the annual wildlife walk led by the London Wildlife Trust some identification of plants took place. At one stage a tufted grass was called out as “Meadow foxtail” and that is exactly what you would expect to find in a meadow flowering at this time of year. In the adjacent Dog Kennel Hill SINC (Site of Importance for Nature Conservancy) I have been seeking to identify and catalogue the flora in our managed meadow with the project now beginning to encompass the woodland, hedgerows and verges. 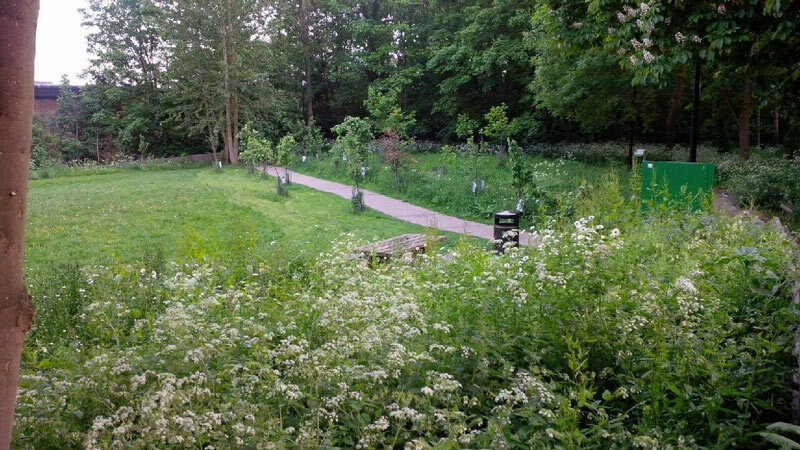 In one of the important seeding’s to support our woodland meadow a particular seed mix was used and re-used. Admitting grasses were not high on my identification agenda, I had taken the seeds listed as best guide. 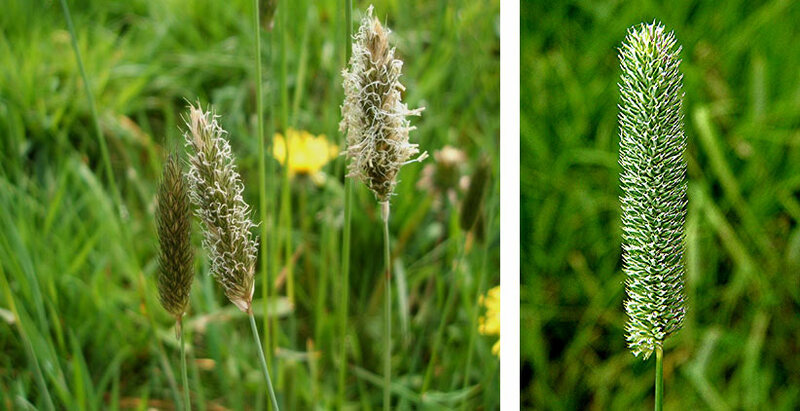 The tall tufted grasses should have been either Meadow foxtail (Alopecurus pratensis) or Smaller cat’stail (Phleum bertolonii). In last year’s survey I happily listed both as found from April onwards and left it at that. round to grasses. Turns out the tufted grass showing so well in Dog Kennel Hill woodland meadow, in the middle of May,is no Meadow foxtail at all. Nor can it be Smaller cat’s-tail when it comes down to ligules, awls and glumes. Blunt ligules and stems bent at sharp angles at the base rules out Meadow foxtail with ligules 1-2.5 milli-metres long and a slightly tattered top plus lacking the bent stem. Timothy flowers much later and Smaller Cat’s tail has pointed ligules. But, in terms of flowering season the best bet is Meadow Foxtail (April – June). Admittedly, I am only just getting started at this game but the length of the tail in the name adds a key bit of evidence. Our cylindrical flower heads are 6 cm long at most. I took a tape measure with me to the meadow today and found them to be between 5 and 6 cm. 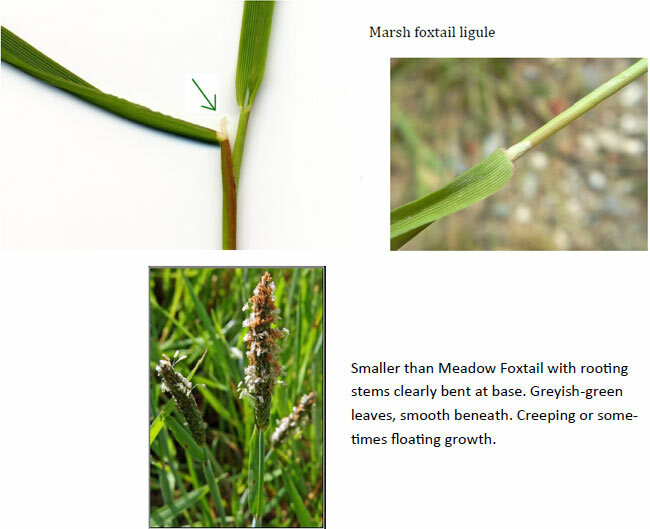 Spot on for Marsh Foxtail. But, this should be flowering between June and September. Too early? Climate change can suggest a resolution to this quandary. Lovely Mum, who helps me with identifications backed by her years and years of rambling in search of the rarest of flora, keeps marvelling at all our finds in one tiny open space. She often remarks how strange it is for many of the DKH Wood flora to be out before their time. London is warmer and when looking to identify I have had to learn to be willing to adjust flowering session accordingly. Our tufted, grey-green perennial with stems bent at sharp angles at the base is Marsh foxtail (Alopecurus geniculatus) and it loves a damp grassland. Early days yet but we look to be down 2 species on last year but up an important plant telling us much about the water-table for Green Dale and Dog Kennel Hill Wood.